Now that the weather is getting colder and now that I have added succulents to my garden containers, it is important to know how to protect them from frost. Usually perennials respond to winter cold by dying to the ground. In spring, their roots send out new growth. 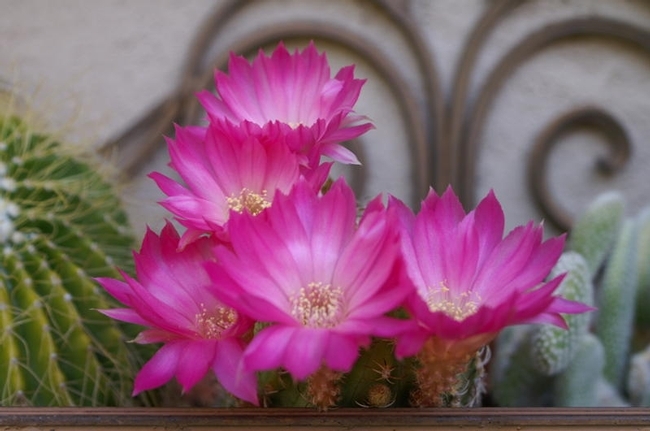 But many succulents from mild climates don't have this adaptation, and need special care when grown where temperatures drop below 32 degrees F.
Here are some tips from succulent photojournalist and author, Debra Lee Baldwin. 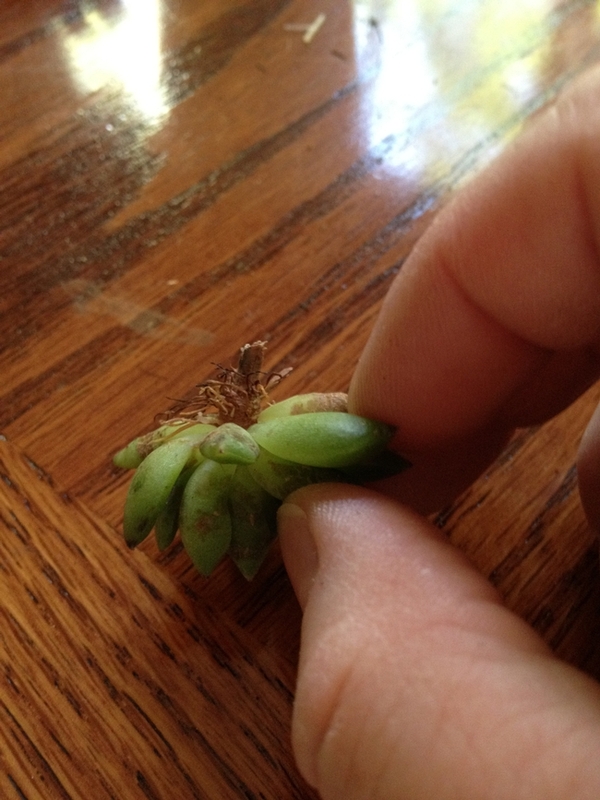 -- Don't peel away dry leaves attached to a succulent's trunk or stem. They protect it from temperature extremes (cold and hot). 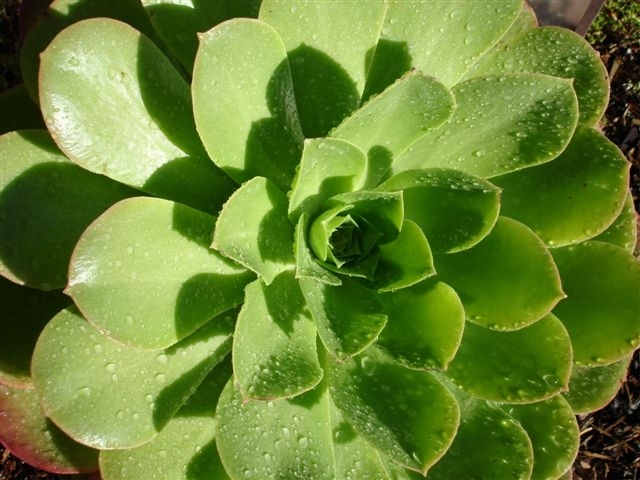 -- Keep succulents on the dry side. Cells that are turgid are more likely to burst when the liquid within them freezes. -- Place pots against walls, hardscape, boulders and/or shrubs that absorb and slowly release the day's heat. South- and west-facing exposures are best. -- Drape succulents with frost cloth (sold at nurseries) or old bed sheets. Avoid plastic, which traps moisture, doesn't let plants breathe, and intensifies sunlight. -- Remove collapsed leaves only if it's likely they'll stay moist and decay. But if they'll protect the plant from future frost, leave on and prune in spring. -- Preserve the geometry of slender-leaved succulents (such as agaves and aloes) by trimming tip-burned leaves to a point, rather than cutting straight across. -- Chalk it up to experience. Now you know that particular plant is vulnerable and needs a protected location. (This is my gardening style that I am trying to improve by joining the Solano Master Gardener program). Recently I escaped the summer heat and ventured to the Succulent Extravaganza hosted by Succulent Garden’s owner Robin Stockwell. This working nursery is in rural Castroville and gardeners flocked there September 30 and October 1 to hear presentations by landscape architects, garden curators, authors and succulent growers. They also enjoyed great hospitality, free treats, habitat walks, and extensive shopping through three green houses. 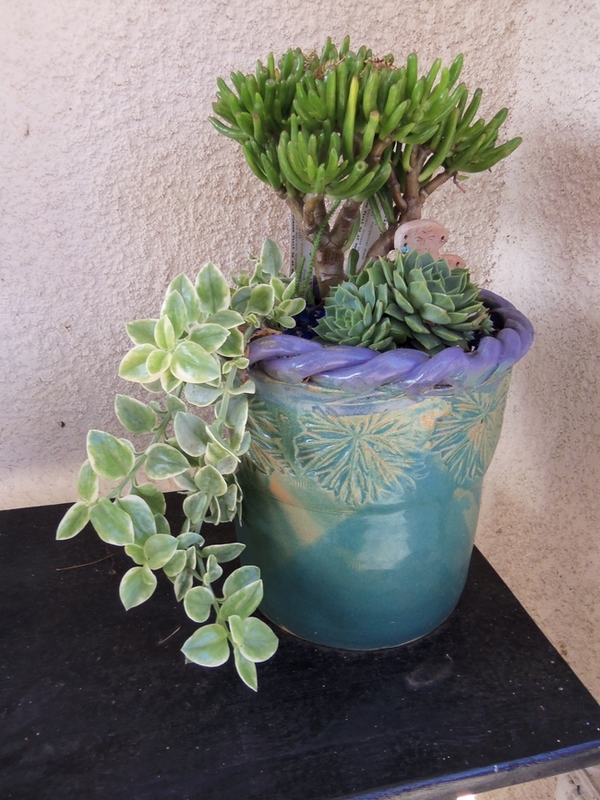 I planned my trip to hear Debra Lee Baldwin, author of Designing Container Gardens with Succulents. She gave tips for eye-catching containers and showed numerous slides that accentuated her main design principle of repetition. She stressed repeating shapes or colors found in the containers with color and shapes of the succulents. 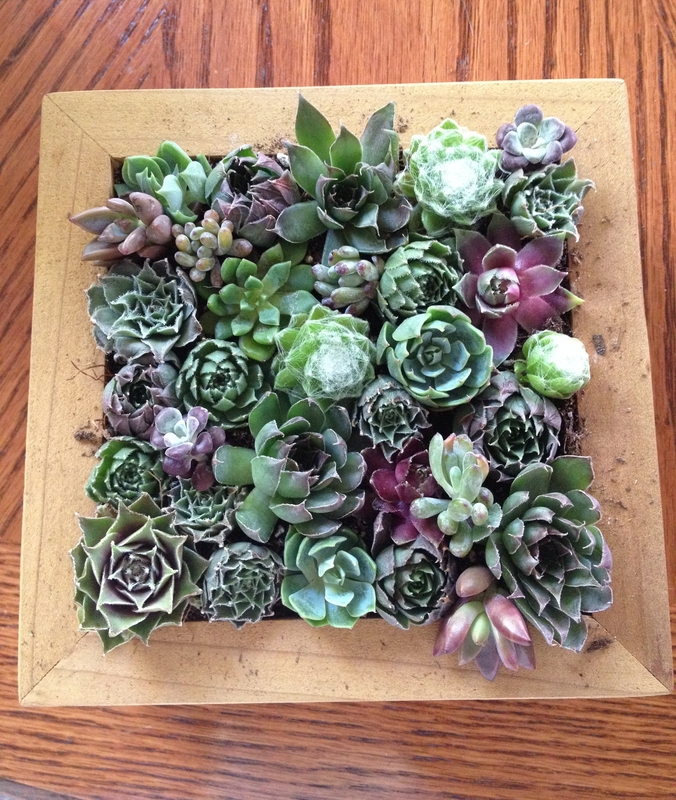 She also said that a new trend is to put semi-precious stones into containers with the succulents. She recommended mounding the soil in the center when planting a pot to create height and depth. Debra’s “not so secret” succulent planting mix contains potting soil and pumice (crushed volcanic rock). 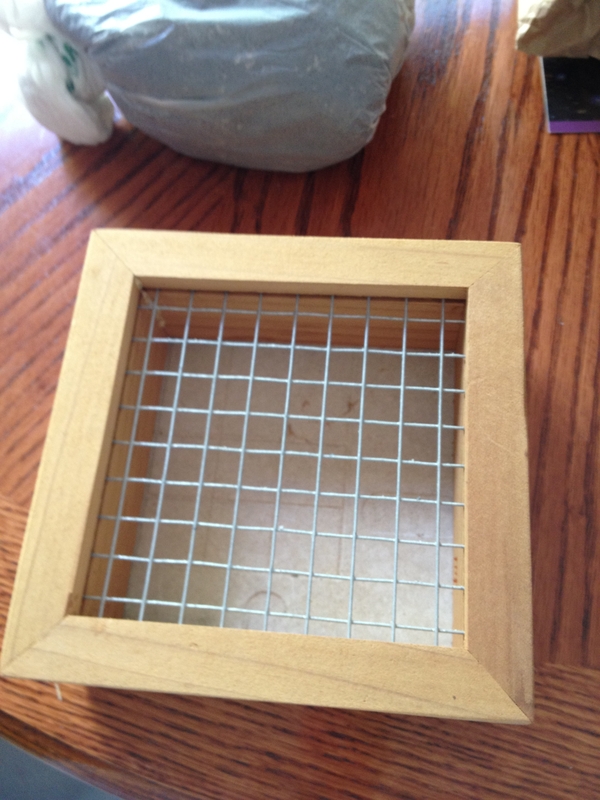 She said that pumice is easily attained at local livestock supply stores under the brand name, Dry Stalls. She adds this to her mix to promote drainage. 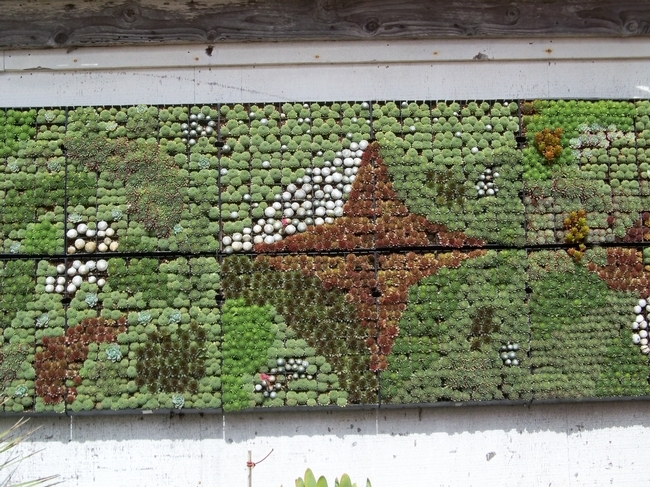 Another attraction for me at the nursery was the outside gazebo that was wall papered with panels of hanging succulents. The succulents were planted in plastic hanging forms that allowed the creators to use plant shapes and colors to develop designs. 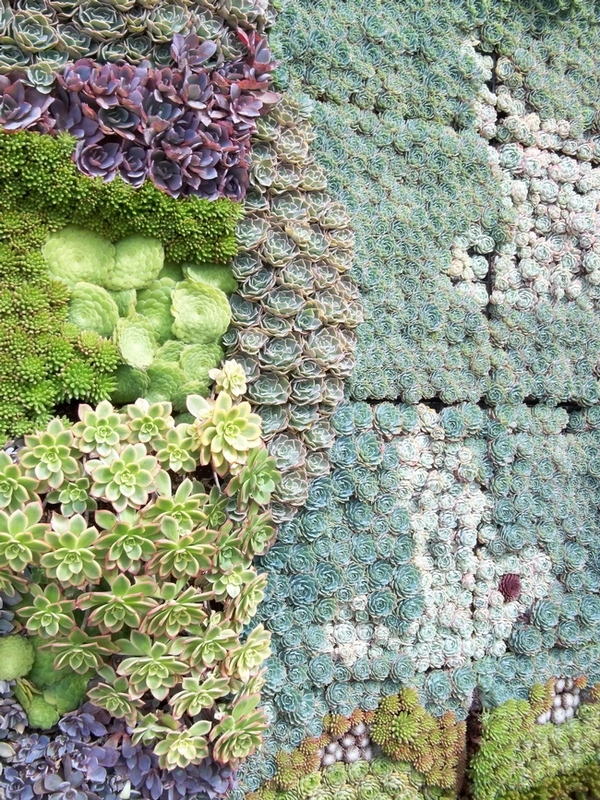 On another building, I looked up to find a beautiful succulent mural or what Robin calls a “living wall”. On a much smaller scale, I made my own vertical garden by using wooden wine box for the container. It is easy to remove the wooden lid, cut a piece of ½ inch fencing the same size and slide it in. Next I filled the box with a cactus mix blend of soil (before I heard Debra speak) and poked succulent cuttings in the squares. Then you keep the box in a shady spot, lying flat until the succulent grow roots and they don’t come out when you tug on them. After about six weeks, I hung up my box to enjoy. Now I have a whole new appreciation for succulent design, versatility, and variety of plants. With the new plants I picked out during the succulent event, I am looking for containers and areas in the garden to create eye-catching designs. 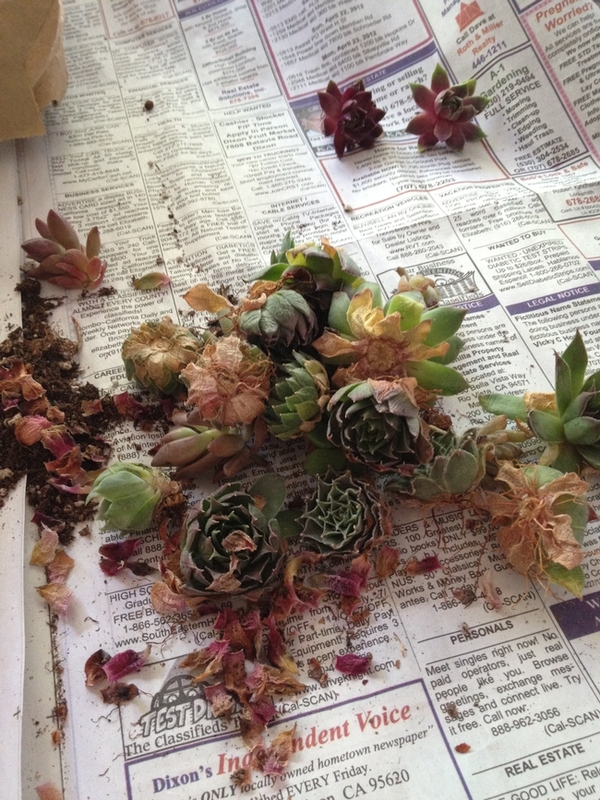 After attending a session on succulent container gardening at UC Davis, I decided to try it. This is my first attempt. When I purchased the succulents, I thought it would be too crowded in the planter but there is space. As they grow, I think it will fill it, but if not I plan to add some other succulents. There are many kinds of succulents and I just got a few different ones. They have shallow roots so I put rocks in the bottom of my planter. Then I used packaged soil designed for succulents or cactus mix. It is more porous that the usual potting mix and helps retain water for longer periods. This one is located at the entrance to our gazebo and gets morning and early afternoon sun then some shade. It seems to be doing well. I water it about every two weeks slowly with at least a quart of water. But if I forget they are very forgiving. This winter I will move them to a sheltered area when frost is in the forecast. You might want to try this type of gardening. There are so many different and variety of plants that it is fun to select a interesting combination for your container. And it doesn’t require a lot of care or frequent fertilizing.